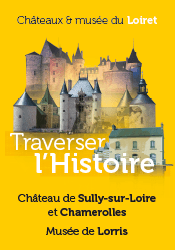 Sully-sur-Loire is 81 miles (130 km) south from Paris. One parking area for cars, motorcycles and bicycles is at your disposal near the castle (330 feet, 100 m). A left-luggage office is located at the begining of the tour, for baby push-car, helmets or other baggages. An area for camping cars is available alongside the Loire, 1,000 feet from the castle. You’ll find accomodations and restaurants in town, just 330 feet away (100 m). The castle’s park is also a picnic area, and children area is located along the Loire. Languages spoken to welcome visitors: French and English. Don’t hesitate to ask us any question you have that these pages didn’t answered, with our Online Contact Form.